Artemisia has been shown to be effective in the treatment of malaria. Artemisia annua is an herb traditionally used in Chinese medicine to treat fever, inflammation, and malaria. A compound in artemisia was shown to be effective in treating malaria in a clinical trial. Another case study showed that artemisia was effective in treating chronic bladder infection. Other studies suggest it may be helpful for osteoarthritis. Artemisia prevented cancer cells from dividing in laboratory studies but clinical trials have not been conducted to support this. Several clinical trials support this use. However, recurrence is more likely than with conventional antimalarial treatment. Preliminary studies suggest that artemisia may be helpful for hip or knee osteoarthritis. Laboratory studies have shown some effect. Human data are lacking. You are taking antiseizure medications: Artemisia can induce seizures making such medications less effective. Hepatitis: In a 52-year-old man following consumption of an herbal supplement containing artemisinin. Skin rash: With topical use of artemisia. Hearing loss, ringing in the ears, and dizziness: Possibly related to oral artesunate, an active artemisia compound, among several advanced breast cancer patients in a safety trial. The study drug was otherwise largely well tolerated among patients. Commonly known as wormwood or sweet sagewort, Artemisia annua has been used in traditional Chinese medicine for reducing fevers, inflammation, headaches, bleeding and for treating malaria. In vitro studies indicate that artemisinin, the active principle of A. annua, may be an effective treatment for protozoal infections including leishmaniasis (8), Chagas’ disease, and African sleeping sickness (9). Systematic reviews of artemisinin show that it is as effective as quinine in treating both uncomplicated and severe malaria (4) (5). However, increased risk of relapse may limit its uses (6) (7). It is also unclear whether A. annua is effective against strains of malaria that are resistant to quinine. In one RCT, a low-dose formulation of artemisia produced clinically relevant pain reductions in patients with hip or knee osteoarthritis (3). A subsesquent open-label continuation study demonstrated long-term safety with maintained improvements at 6 months (10). A. annua has also been investigated for its anticancer properties. Terpenoids and flavonoids isolated from the herb exert cytotoxic effects in several human tumor cell lines (1) (18) (19) (20). The constituents artemisinin and artesunate have been studied as anticancer treatments (25) (26). In a recent safety study in advanced breast cancer patients, oral artesunate as add-on therapy was well tolerated, although it was determined that regular audiological assessments should be included to monitor for ototoxicity (13) (21). Artemisinin, the active constituent of A. annua, exerts antimalarial effects by free radicals formed via cleavage of the endoperoxide bond in its structure, which are responsible for eradicating the Plasmodium species (23). Artemisinin induces apoptosis and cell cycle arrest of Leishmani donovani promastigotes (8). It has antiproliferative effects on medullary thyroid carcinoma cells (2), and induces apoptosis in a lung cancer cell line by modulating p38 and calcium signaling (14). In another study, it significantly inhibited cell growth and proliferation, and caused G1 cell-cycle arrest in neuroblastoma cell lines (25). Dihydroartemisinin, a semi-synthetic derivative of artemisinin, demonstrates anti-inflammatory activity by attenuating COX-2 production via downregulation of serine/threonine kinase (AKT) and mitogen activated protein kinase (MAPK) pathways (24). Recent findings suggest that dihydroartemisinin-triggered apoptosis in colorectal cells occurs through the reactive oxygen species (ROS)-mediated mitochondria-dependent pathway (26). Patients with ulcers or gastrointestinal disorders should not take artemisia (11). Hepatitis: In a 52-year-old man following consumption of an herbal supplement containing artemisinin (17). Dermatitis: With topical use of artemisia (11). Ototoxicity and vertigo: Possibly related to oral artesunate, an active artemisia compound, among several advanced breast cancer patients in a safety trial (13) (21). The study drug was otherwise largely well tolerated among patients. Antiseizure medications: Artemisia can induce seizures resulting in decreased efficacy of antiseizure medications (11). Cytochrome P450 (CYP450) substrates: Artemisia extracts have induced CYP2B6 and CYP3A4 (27) and may affect the serum concentration of drugs metabolized by these enzymes. Singh NP, Lai HC. Artemisinin induces apoptosis in human cancer cells. Anticancer Res. 2004 Jul-Aug;24(4):2277-80. Zheng GQ. Cytotoxic terpenoids and flavonoids from Artemisia annua. Planta Med. 1994 Feb;60(1):54-7. Stebbings S, Beattie E, McNamara D, et al. A pilot randomized, placebo-controlled clinical trial to investigate the efficacy and safety of an extract of Artemisia annua administered over 12 weeks, for managing pain, stiffness, and functional limitation associated with osteoarthritis of the hip and knee. Clin Rheumatol. Jul 2016;35(7):1829-1836. McIntosh HM, Olliaro P. Artemisinin derivatives for treating severe malaria. Cochrane.Database.Syst.Rev. 2000;CD000527. McIntosh HM, Olliaro P. Artemisinin derivatives for treating uncomplicated malaria. Cochrane.Database.Syst.Rev. 2000;CD000256. Mueller MS, et al. Randomized controlled trial of a traditional preparation of Artemisia annua L. (Annual Wormwood) in the treatment of malaria. Trans R Soc Trop Med Hyg. 2004;98:318-21. Blanke CH, Naisabha GB, Balema MB, et al. Herba Artemisiae annuae tea preparation compared to sulfadoxine-pyrimethamine in the treatment of uncomplicated falciparum malaria in adults: a randomized double-blind clinical trial. Trop Doct. Apr 2008;38(2):113-116. Sen R, Bandyopadhyay S, Dutta A, et al. Artemisinin triggers induction of cell-cycle arrest and apoptosis in Leishmania donovani promastigotes. J Med Microbiol. Sep 2007;56(Pt 9):1213-1218. Mishina YV, Krishna S, Haynes RK, Meade JC. Artemisinins inhibit Trypanosoma cruzi and Trypanosoma brucei rhodesiense in vitro growth. Antimicrob Agents Chemother. May 2007;51(5):1852-1854. Hunt S, Stebbings S, McNamara D. An open-label six-month extension study to investigate the safety and efficacy of an extract of Artemisia annua for managing pain, stiffness and functional limitation associated with osteoarthritis of the hip and knee. N Z Med J. Oct 28 2016;129(1444):97-102. Skyles AJ, Sweet BV. Alternative therapies. Wormwood. Am J Health Syst.Pharm. 2004;61:239-42. Rinner B, et al. Activity of novel plant extracts against medullary thyroid carcinoma cells. Anticancer Res 2004;24:495-500. Konig M, von Hagens C, Hoth S, et al. Investigation of ototoxicity of artesunate as add-on therapy in patients with metastatic or locally advanced breast cancer: new audiological results from a prospective, open, uncontrolled, monocentric phase I study. Cancer Chemother Pharmacol. Feb 2016;77(2):413-427. Mu D, Zhang W, Chu D, et al. The role of calcium, P38 MAPK in dihydroartemisinin-induced apoptosis of lung cancer PC-14 cells. Cancer Chemother Pharmacol. Apr 2008;61(4):639-645. Rath K, et al. Pharmacokinetic study of artemisinin after oral intake of a traditional preparation of Artemisia annua L. (annual wormwood). Am J Trop Med Hyg. 2004;70:128-32. Payne AG. Exploiting intracellular iron and iron-rich compounds to effect tumor cell lysis. Med Hypotheses 2003;61:206-9. Centers for Disease Control and Prevention. Hepatitis Temporally Associated with an Herbal Supplement Containing Artemisinin —- Washington, 2008. Accessed June 22, 2015. Lai H, Nakase I, Lacoste E, Singh NP, Sasaki T. Artemisinin-transferrin conjugate retards growth of breast tumors in the rat. Anticancer Res. 2009 Oct;29(10):3807-10. Willoughby JA Sr, Sundar SN, Cheung M, et al. Artemisinin blocks prostate cancer growth and cell cycle progression by disrupting Sp1 interactions with the cyclin-dependent kinase-4 (CDK4) promoter and inhibiting CDK4 gene expression. J Biol Chem. 2009 Jan 23;284(4):2203-13. Zhai DD, Supaibulwatana K, Zhong JJ. 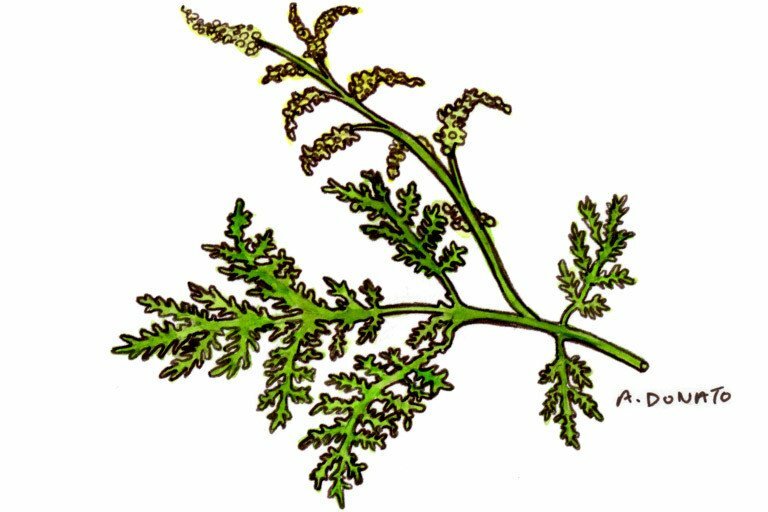 Inhibition of tumor cell proliferation and induction of apoptosis in human lung carcinoma 95-D cells by a new sesquiterpene from hairy root cultures of Artemisia annua. Phytomedicine. 2010 Sep;17(11):856-61. Konig M, von Hagens C, Hoth S, et al. Erratum to: Investigation of ototoxicity of artesunate as add-on therapy in patients with metastatic or locally advanced breast cancer: new audiological results from a prospective, open, uncontrolled, monocentric phase I study. Cancer Chemother Pharmacol. Jun 2016;77(6):1321.
van der Kooy F, Sullivan SE. The complexity of medicinal plants: the traditional Artemisia annua formulation, current status and future perspectives.J Ethnopharmacol. 2013 Oct 28;150(1):1-13. Ho WE, Peh HY, Chan TK, Wong WS. Artemisinins: pharmacological actions beyond anti-malarial. Pharmacol Ther. 2014 Apr;142(1):126-39. Kim HG, Yang JH, Han EH, et al. Inhibitory effect of dihydroartemisinin against phorbol ester-induced cyclooxygenase-2 expression in macrophages. Food Chem Toxicol. 2013 Jun;56:93-9. Zhu S, Liu W, Ke X, et al. Artemisinin reduces cell proliferation and induces apoptosis in neuroblastoma. Oncol Rep. 2014 Sep;32(3):1094-100. Lu M, Sun L, Zhou J, Yang J.Dihydroartemisinin induces apoptosis in colorectal cancer cells through the mitochondria-dependent pathway. Tumour Biol. 2014 Jun;35(6):5307-14. Xing J, Kirby BJ, Whittington D, et al. Evaluation of P450 inhibition and induction by artemisinin antimalarials in human liver microsomes and primary human hepatocytes. Drug Metab Dispos. 2012 Sep;40(9):1757-64.